This is the fourth book I've published on HP Data Protector, and I think it will be a very valuable resource to any sysadmin or consultant working with HP products. If you are involved in pre-sales or implementation consulting you will find lots of useful material in this book. Why customers choose Data Protector, and what its strengths and weaknesses are. Step-by-step, everything you would need in order to backup remote branch offices. Very detailed designs on how you can backup Amazon-hosted cloud servers. How to backup data centres filled with nearly identical virtual machines. Guidance on handling media pools, tape drives and other physical devices. Very detailed information on the internal database that simply isn't available elsewhere -- the results of my reverse engineering what HP has done. If you have complicated reporting needs, this is the book to have. If you are a system administrator / backup administrator, you will find this book a welcome alternative to the HP documentation. I talk honestly about bugs that I've found, what makes sense to do, and what doesn't, and more importantly why certain designs make more sense than others. This book can also be used as a course book if you want to run a one-day training session. All the labs can be run up in the cloud. To keep the price down on the paperback version, it's a B&W print for all 374 pages. The Kindle version is full-colour if you have a full-colour device. The paperback version has a comprehensive index to make this into an ideal reference to have at your desk. It is enrolled in matchbook, so you can have both the paper version and the kindle version for only slightly more than the paper version. Buy both! 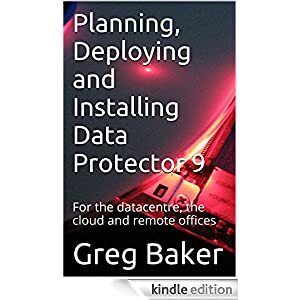 There is also a companion book on Data Protector for operators with a topics around restoring, supporting and maintaining. Greg Baker is one of the world's leading experts on HP Data Protector. His consulting services are at http://www.ifost.org.au/dataprotector. He has written numerous books (see http://www.ifost.org.au/books) on it, and on other topics. His other interests are startup management, applications of automated image and text analysis and niche software development.